It's the Most Wonderful Time Of The Year....Back to school time. I think I get a strange kind of "high" about this time each year. I think it's a combination of the cheap school supplies on sale as well as knowing my kids will be going starting a whole new year with new experiences and going to school all day, really excites me. I love it. 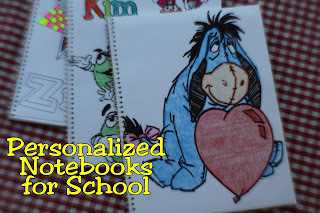 But have you noticed how kids all seem to want the themed notebooks and supplies? The ones that AREN'T on sale? And it's like the stores raise the prices on the New Direction, Princess, and Superhero notebooks to make up for the prices on the other supplies. YIKES! So we decided to make our own personalized notebooks this year for school. That way, my kids can get any theme they want as well as an afternoon of coloring. Now go ahead and google search for a coloring page with the theme that your kids want. We did one with M&M characters, one with Eeyore, and one with a fun geometric design. Print out your color page to whatever size that your notebooks are. Mine were 8 x 10 1/2 inches. But double check because you don't want it too small. Go ahead and let your kids color their page. This should keep them busy for a while, especially if you have a yummy snack to eat while working. I LOVED having an hour or so of no fighting. While the kids are quietly coloring, you may want to do this next part, because trust me...it's not something you want to tackle while the kids are underfoot. It can be a bit frustrating depending upon your type of notebook. You need to remove the spiral from the paper and notebook. To do this, you need to unlatch the spiral at the top and bottom of the notebook. Then slowly "unroll" the spiral up and out of the notebook. It's easiest if you try to rebend it so it just flows, but not all notebooks are created equal in the ease of this. Now go ahead and cut out along the edge of the coloring page so the laminate is only on the page. Now if you have a son that likes to doodle in class or doesn't finish his elaborate design, you can decide not to laminate it and just continue. This will allow your kids to color their notebook later at their own pace. Using the front of the original notebook, line up the top with the laminated coloring page underneath. I like to use binder clips to secure the pages so they don't move around while I'm working. It's not fun to have to keep re centering your pages. Using your 1/8-Inch, Circle hole punch, punch holes through the coloring page using the notebook front as a guide. Remove your binder clips and discard the original notebook front. Using the coloring page as your new notebook front, line the pages all back up and re-thread the spiral through the front, paper, and back of your notebook. This is usually a little easier than un-spiraling. 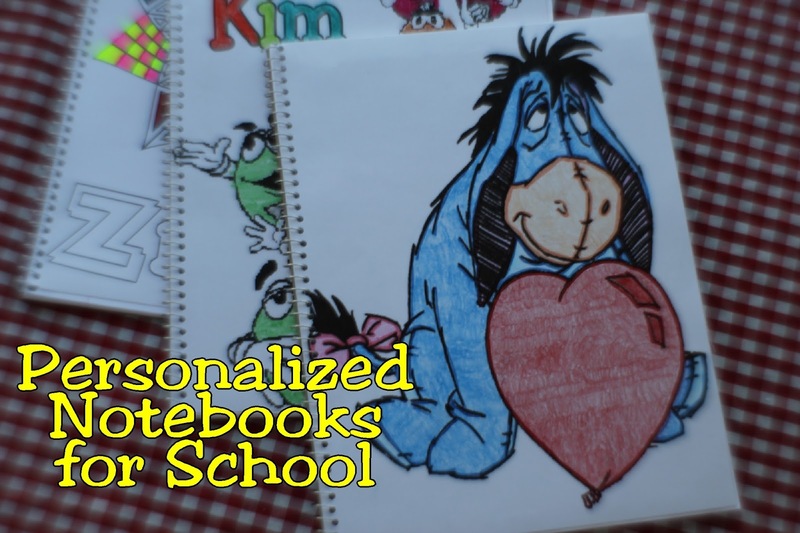 Now you have new themed personalized notebooks for your kids at a cost that won't kill the Back to School mood.